Welcome back to our blog! Last time, we looked at some of the reasons to reserve a spot for your dog in our state-of-the-art pet resort here in Northland. If you have an upcoming trip, have an out-of-town emergency, or have a business trip to attend, you can count on our dog boarding team to care for your dog while you’re away. 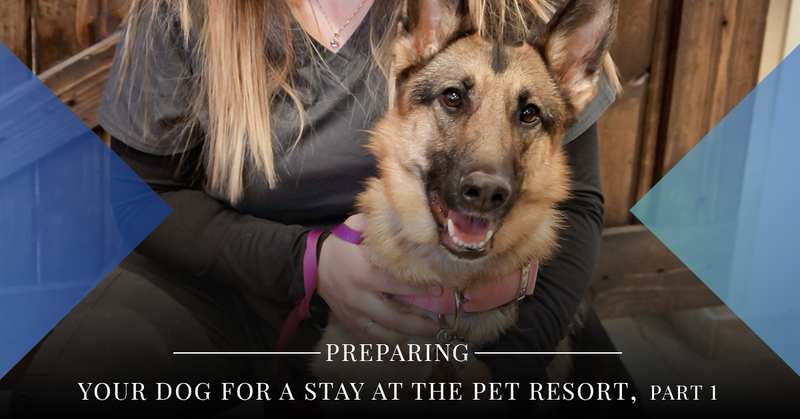 In today’s post, let’s begin looking at a few tips to help you prepare your dog for a stay with us at Eagle Animal Hospital and Pet Resort. Continue reading part one of our short blog series below to learn more. Most pet resorts, including our own, require pet parents to schedule their furry friends for a Temperament Test before they come to stay. This is a series of tests performed to measure your dog’s characteristics such as friendliness, aggressiveness, shyness, confidence, protectiveness, and other traits. This test is meant to ensure the safety of your dog, our animal care specialists, and other boarders during your pooch’s stay with us. We require this test for all pups coming to stay in both our pet resort and our doggy daycare, and the test only takes a few minutes for most dogs. Tests may last a bit longer for dogs who are more nervous and anxious, so that we can determine any special needs they may require during their stay with us. Bringing them in for a Temperament Test is a great way for us to meet your furry family member, and for them to become acquainted with our pet boarding team and our facility. Next, you’ll want to make a reservation for your dog to stay in one of our many cozy and secure dog suites. This should be done while you’re making your own reservations for travel and lodging to ensure we have a suite open for your dog during the dates you plan to travel. Doing this early on means one less thing for you to do in the weeks and days leading up to your trip. These are just a few of the ways to prepare your dog for an enjoyable, comfortable, and safe stay with us at Eagle Animal Hospital and Pet Resort in Kansas City. Join us next time as we look at more ways to prepare your pup for a stay in our Northland dog boarding facility. You may access all of our dog boarding and doggy daycare forms by clicking on the link.